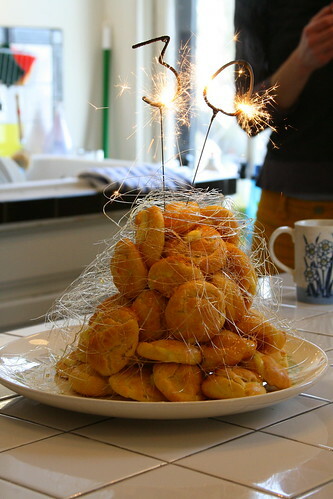 I realized, in going through old posts, that I still owe you a post about my magical birthday confection, a croquembouche! Shane did a marvelous job of taking pictures, and Olivia has already posted a fantastic summary from imagination to execution to consumption. I did an excellent job of making a sugar volcano when the caramel sauce got a little too caramelized. The end result? A delicious, delicate tower of pastry full of vanilla bean-y cream. Each profiterole did, in fact, crunch in the mouth, and I felt like a little kid as I licked sticky sugar off my fingers. And I felt a rush of both pride – in having tackled a fancy baking challenge – and sugar, both of which are very good things on one’s birthday.